….but the ride across Sydney Harbour Bridge in the morning made it all worthwhile. I was on the Sunshine Coast, Queensland, when I called my mate Holmsey about coming to Adelaide. He said he was just at that moment checking out buying a touring motorbike in Sydney. Purely on a whim he said. Tongue in cheek, says if he bought it would I ride it back. I was thinking of going via Sydney anyway to see a publisher on the way down for the My Senior Gap Year book. Of course I’d need a helmet and all the leathers. Nephew Sam in Sydney says no worries, leave it with me. So here it is, a few days later on a 1400km trip from Sydney to Adelaide. On me mate’s Yamaha XJ900S motorbike he was looking at 5 minutes before I called, wearing the gear from one of nephew’s customers that came in 5 minutes after I spoke to him! I like bikes. My bikes don’t normally have an engine in them though. I did have a bike with an engine once. I was about twenty then so few years back. It was a small trail bike. I bought it take up north when I was working in the outback. Of course had to get a bike license first. Things were different those days. Local cop says, ride it around the block and come back to me. Fortunately he was talking to someone when I came back and didn’t notice me stop twenty metres past him. I hadn’t quite got my coordination sorted out at that stage. I got my license. So here in Hay overnight. If it was a car I’d be in Adelaide now. I’m an on a mission sort of guy when it comes to long trips. We were once doing the three thousand kilometer trip Adelaide to Perth. Despite what my wife said at the time, I’m still convinced there were whales I could see by our torchlight at the Great Australian Bight whale watching lookout. We were on a schedule! Riding a bike definitey requires a few more breaks. I don’t know where Hay got its name from. But I do know what it’s famous for. Hayfever. I had just reached the outskirts of town and the sneezing started. It’s that time of the year. Warming up. Grasses drying. Perfect conditions for hayfever sufferers. And that’s what I found here. Its all over the place. Everywhere. You can’t miss it. I’m talking about the inside of my helmet of course. Yes, I agree, it’s disgusting. I’m convinced though in years to come hayfever will be eradicated in Hay. That’s thanks to you. The more wine you drink, the less problem hayfever will be here. It’s been a few years since I came through here. I was surprised by the change. In the middle of this dry dusty plains, are popping up fields of green vineyards. So keep up the great effort. Drink more wine. Thst means they’ll definitely need to plant more vineyards in places like this which will replace all the dry grass. And that will be great news for hayfever sufferers passing through Hay…. and the inside of my helmet. Its all been part of an enjoyable ride and experience. First long ride. From the magnificent setting riding across Australia’s iconic Sydney Harbour Bridge, the famous Opera House to the left set with all the activity, the boats, ferries on the harbour water below. Through the beautiful rolling green hills of the Great Dividing Range. And on to the dusty stretches of the Hay Plains. All in a day’s ride. So look out Adelaide. The My Senior Gap Year bikie’s coming to town! Actually I nearly missed out on that fantastic start to the day. I purposely had set the map on the phone to completely avoid the city…. with phone duct taped to the handle bars. Never leave home without duct tape. For some reason, map must have had other ideas as next thing I know i was actually heading through the city via the bridge. But what a spectacular start to the day I would have otherwise missed. Funny how things happen! You won’t be able to see where you’re going with all that sneezing! Michael says take high dose Vit C. I’m sure you’ve heard that before. Well, massively relieved that my crazy mate has arrived here safe and sound. 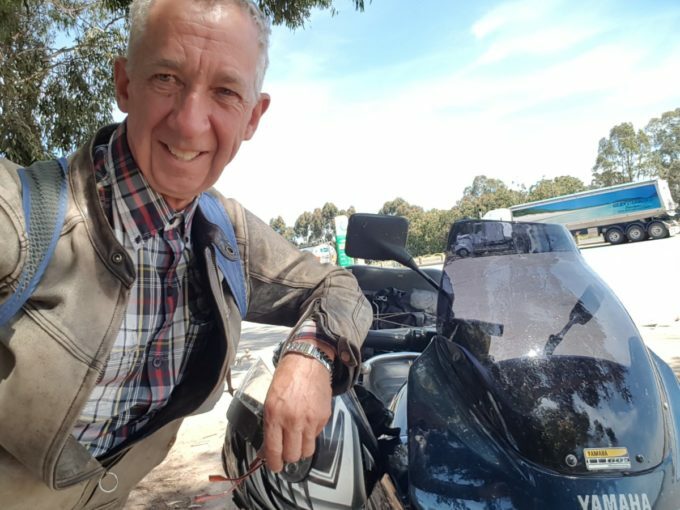 Ya know, you throw out an off the cuff comment about riding a big touring bike from Sydney to Adelaide and he jumps at the idea befoe I had any time to think of the myriad of disasters that could befall him. Anyway, after 3 sleepless nights, my sleep pattern is almot back to normal. Well done you crazy bugger.